There is "clear and convincing evidence" that chemical weapons were used on a relatively large scale in an attack last month in Syria that killed hundreds of people, UN inspectors say. UN chemical investigators today confirmed the use of sarin nerve agent in an Aug. 21 poison gas attack outside the Syrian capital in a long-awaited report that the United States, Britain and France said proved government forces were responsible. 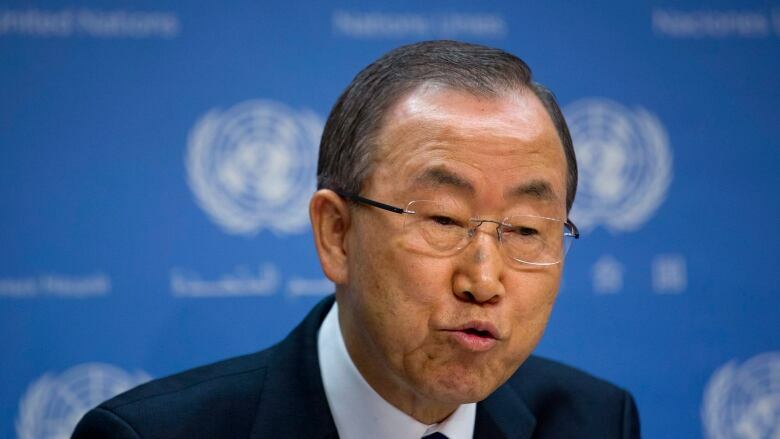 "This is the most significant confirmed use of chemical weapons against civilians since Saddam Hussein used them in Halabja [Iraq] in 1988," UN Secretary-General Ban Ki-moon said. "The international community has pledged to prevent any such horror from recurring, yet it has happened again." "On the basis of the evidence obtained during the investigation of the Ghouta incident, the conclusion is that chemical weapons have been used in the ongoing conflict between the parties in the Syrian Arab Republic, also against civilians, including children, on a relatively large scale," said the report by chief UN investigator Ake Sellstrom of Sweden. The UN team was investigating only whether chemical weapons were used in a deadly assault on the rebel-held Damascus suburb of Ghouta. Syrian President Bashar al-Assad has denied that his military was responsible. The report does not say who launched the attack, though U.S., British and French envoys said technical details in it pointed to government culpability. Canadian Foreign Affairs Minister John Baird did not need to be convinced, saying the report only further bolsters "the conclusion that inhumane and indiscriminate chemical weapons were used by the Assad regime." Baird said the regime will now have to be held to account before an international community that is "united" against what he described as "Assad’s attacks against his people." Unless Assad fully complies with a U.S.-led framework to hand over Syria's cache of chemical weapons, Baird added, the regime should expect to be dealt with "in a serious and firm manner." The report said the weather conditions on Aug. 21 ensured that as many people as possible were injured or killed. Temperatures were falling between 2 a.m. and 5 a.m., it said, which meant that air was moving downward toward the ground. On Friday, Ban said Assad "has committed many crimes against humanity," though he did not specifically blame him for the Ghouta attack. He added that Assad would be held to account for his crimes. Syria and Russia have blamed the Aug. 21 attack on the rebels. The rebels, the United States and other Western powers blame forces loyal to Assad for the Ghouta attack. It is not immediately clear whether any of the details in the report suggested culpability. British, French and U.S. envoys told reporters the UN report left no doubt that Assad's government was responsible for the chemical attack. Russian UN envoy Vitaly Churkin countered that there was no scientific proof government forces were responsible for the sarin attack. "We need to not jump to any conclusions," Churkin said. British UN Ambassador Mark Lyall Grant said the rocket samples examined had a payload of 350 litres, which was 35 times the amount used in the Tokyo subway attack in 1995. "In response to a question Mr. Sellstrom confirmed that the quality of the sarin was superior both to that used in the Tokyo subway but also to that used by Iraq during the Iraq-Iran war," he told reporters. The investigators studied five impact sites and were able to determine the likely trajectory of the projectiles at two sites: Moadamiyah and Ein Tarma. Eliot Higgins, who blogs under the name of Brown Moses and has been tracking videos of weapons used in the Syria conflict, wrote that he has not seen the opposition using the munitions identified in the report: a variant of the M14 artillery rocket and a 330 mm calibre artillery rocket. Rebels have seized all kinds of weapons from military depots across the country in the 2 ½-year civil war that has killed over 100,000 people, according to the United Nations. But Amy Smithson, a chemical weapons expert at Monterey Institute, said the Aug. 21 attack bore "so many hallmarks of a military trained in chemical warfare doctrine" and not an untrained force. "The Assad government has been in the business of chemical weapons since the 1970s. They are trained in military doctrine. They also have chemical delivery systems that the rebels don't," she said. The UN confirmation of sarin gas use on Aug. 21 comes as France, Britain and the United States agreed in Paris to seek a "strong and robust" UN resolution that sets binding deadlines on removal of chemical weapons. Those talks followed a weekend deal on Syria's chemical weapons reached by the United States and Russia that could avert U.S. military action. 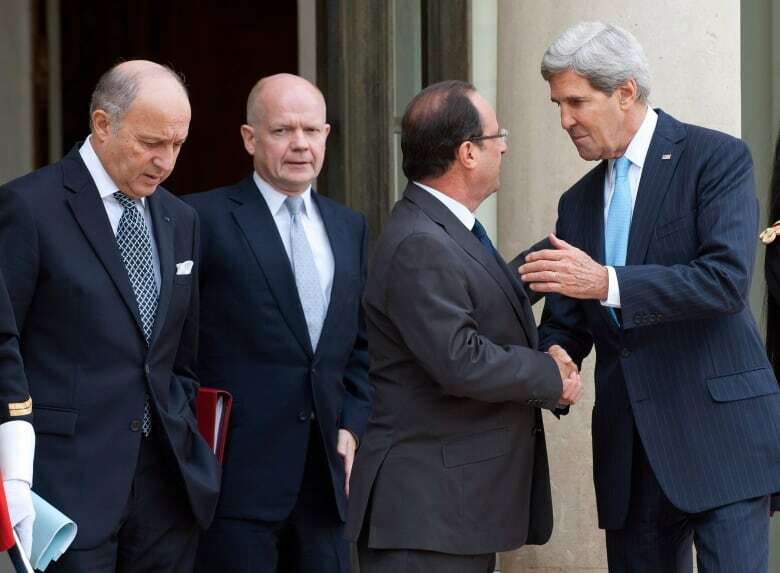 U.S. Secretary of State John Kerry ended a weeklong diplomacy tour in Paris on Monday after laying out with his French and British counterparts a two-pronged approach in Syria. They called for enforceable UN benchmarks for eradicating the chemical weapons program and an international conference bolstering the moderate opposition. Kerry was pressing for support for the ambitious agreement that averted threatened U.S. military strikes. It calls for an inventory of Syria's chemical weapons program within one week, with all components of the program out of the country or destroyed by mid-2014. France and the U.S. insisted that a military response to the Aug. 21 attack remained on the table, and were pressing for a UN resolution reflecting that in coming days. "If Assad fails to comply … we are all agreed, and that includes Russia, that there will be consequences," Kerry said.But Russia's foreign minister, Sergey Lavrov, said ongoing attempts to threaten the use of force against Syria would provoke the opposition and disrupt a chance for negotiations. Meanwhile, invitations were going out Monday to top members of the Syrian National Coalition — the main umbrella opposition group — for an international conference in New York timed to coincide with next week's UN General Assembly meeting, French officials said. "He must understand that there is no military victory, no possible military victory for him," Fabius said. He acknowledged that broad popular support for the rebels has been hampered by fears that Islamic militants are now playing a major role in the 2 ½-year-old uprising that has left more than 100,000 dead. Syria crisis: Why the taboo on chemical weapons? MAP: Who has agreed to the Chemical Weapons Convention? Can Canada do anything about Syria?